Successfully Added 15W Spotlight LED Light Bulb (Warm White) to your Shopping Cart. Bright 15 Watt Warm White Spotlight LED Light Bulb which fits in all incandescent screw-in bases. Save energy, save money, and save the environment with these LED light bulbs, mainly used for spot lighting and flood lighting tasks where directional lighting is needed. These professionally engineered LED light bulbs fit into any incandescent lamp socket to bring you a bright warm white color light, which is many times more environmentally-friend and energy-efficient your normal incandescent light bulb. The design and manufacture of these LED lights is also beyond compare - from the all metal die cast cooling fins to the IC boards that drive the diodes, every part has been manufactured to exceed world performance standards. Great for retrofitting into existing track lights, downlights, or other lighting fixtures with a spot type lighting distribution, these white spotlight LED light bulbs deliver smooth and uniform light without any flicker. The warm white color of this LED light is as "natural looking" as incandescent, but will potentially save you hundreds of dollars every year on your energy bill versus an existing incandescent bulb! Chinavasion offers this new spotlight LED light bulb at a low, factory-direct wholesale price, so order your samples now and stock up on larger quantities of this new LED bulb to sell at your online / physical store. In stock in our warehouse right now, order today and we will ship them out to you tomorrow - guaranteed! These L.E.D. bulbs work most satisfactory when used to replace incandescent bulbs in track lights, downlights, or spot lights. A good energy savings choice for replacing 100 watt PAR38 lamps. 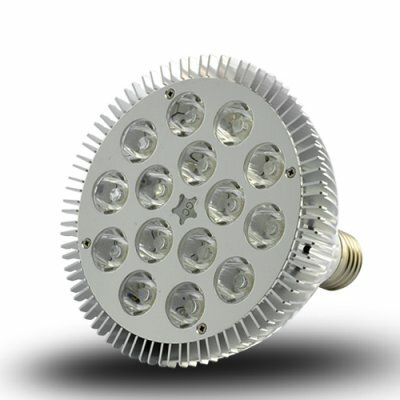 True professionally designed LED Light (made with heavy gauge all-metal casing), not plastic like the cheap LED lights on the marketplace today. This is important - most LED's in the market today use plastic casings that will only last a few months before degrading, the H31 has an all metal design that will give you years of reliable use. Will this fit into my current lighting fixture? The size of this bulb is the same as a standard incandescent base PAR 38 style lamp, so it will fit into any existing PAR 38 lighting fixture. Does this LED Lamp produce any heat? Can I touch it when the light it on? Unlike a standard PAR38 incandescent or halogen lamp, this LED lamp is can be touched when it is on, though we still advise turning off your light fixtures before changing the lamps inside.